GL-100, GL-H100, PT-1000, PT-1000BM, PT-1010 PT-1010B, PT-1010NB, PT-1010R, PT-1010RDT, PT-1010S, PT-1090, PT-1090BK, PT-1100, PT-1100QL, PT1100SB, PT-1100SBVP, PT-1100ST, PT-1120, PT-1130, PT-1160, PT-1170, PT-1170S, PT-1180SC, PT-1180SP, PT-11Q, PT-1200, PT-1280BT, PT-1280SP, PT-1280SR, PT-1280TG, PT-1280VP, PT-128AF, PT-1290, PT-1290BT, PT-1290BT2, PT-1290RS, PT-1290SBVP, PT-1300, PT-1400, PT-1500, PT-1500PC, PT-1600, PT-1700, PT-1750, PT-1750SC, PT-1830C, PT-1830SC, PT-1830VP, PT-1880SC, PT-1880W, PT-1890SC, PT-1890W, PT-18R, PT-18RKT, PT-1900C, PT-1910, PT-1950, PT-1960, PT-200, PT-2030AD, PT-2030VP, PT-2100, PT-2110, PT-2200, PT-2210, PT-2300, PT-2310, PT-2400, PT-2410, PT-2470, PT-2500PC, PT-2600, PT-2610, PT-2700, PT-2710, PT-2730VP, PT-300, PT-300B, PT-310, PT-310B, PT-320, PT-330, PT-340, PT-350, PT-3600, PT-4000, PT-520, PT-530, PT-540, PT-550, PT-580C, PT-6100, PT-7100, PT-7500, PT-7600, PT-9200DX, PT-9200PC, PT-9400, PT-9500PC, PT-9600,C, PT-9800PCN, PT-D200BT, PT-D200DA, PT-D200MA, PT-D200SA, PT-D210BK, PT-D400AD, PT-D400VP, PT-E100, PT-E300, PT-E300VP, PT-E500, PT-E500VP, PT-E550W, PT-E550WVP, PT-H100P, PT-H100R, PT-H105, PT-H300LI, PT-H500LI, ST-1150, ST-1150DX, ST-5. At Aoimark, we believe in our products. That is why we back them all with an 12-month warranty and provide friendly and outstanding support. Applications:Perfect for presents wrapping and diy crafting. COMPATIBLE WITH BROTHER LABEL MAKERS - PT-D200, PT-D210, PT-D400, PT-D450, PT-D600, PT-P700, PT-1230PC, PT-1280, PT-1800, PT-1810, PT-1830, PT-1880, PT-2030, PT-2430PC, PT-2730, PT-D800W, PT-H100, PT-H110, PT-H300, PT-1180, PT-1190, PT-1880C, PT-1890C, PT-1900, PT-9700P, PT-D600VP, PT-P750W, PT-P750WVP, PT-P900W, PT-P950NW, P-touch CUBE, Blue, White, P-touch Embellish and More. EASILY READABLE RESULT - Print out the words or patterns of what you want, such as "Happy Birthday", "Merry Christmas" "Happy Halloween"etc onto the ribbon and express your best wishes to your loved one. Best for Valentine's Day, Christmas, Easter, Halloween and more festivals gifts. 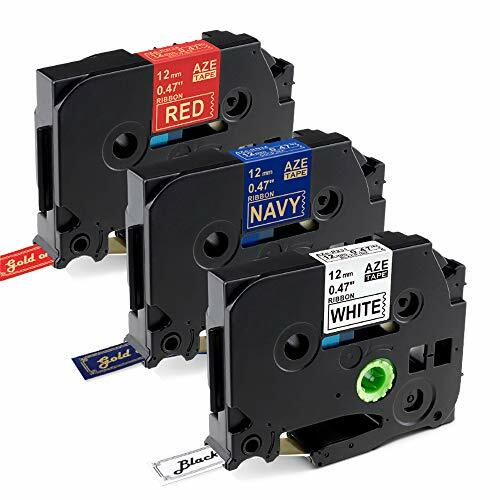 3 COLORS TO MEET YOUR NEEDS (One Color Per Pack): Black on White (TZe-R231), Gold on Navy Blue (TZe-RN34), Gold on Red (TZe-RW34). 12mm (1/2") wide, 4m (13.1') long each cartridge. LUXURIOUS FABRIC RIBBON TAPES - With a luxury shiny finish, this non-adhesive fabric ribbon is perfect for present wrapping and crafting. MULTI-PURPOSE LABELS - Add artistic touches to your own crafted decoration, furnishings, gifts, cards, wedding centerpieces and so much more - you'll be amazed with the amount of creative projects where you can use these versatile ribbons and tapes. If you have any questions about this product by Aoimark, contact us by completing and submitting the form below. If you are looking for a specif part number, please include it with your message.